While the bride and groom will have shared friends that have enjoyed the journey of their love with them, it is likely that there will be many people coming to the wedding who only really know one side of the wedding party. Whether these people are distant relatives, work colleagues or friends who have a shared interest, it is likely that many guests will come to the wedding favouring one side of the party and will not know too much about their friend or relatives’ partner. The One wedding invitation from White Attic Designs is a hugely unique and innovative style of wedding invitation that aims to change all that. If any couple is looking for a personal wedding invitation that is fun, stylish and hugely informative about the happy couple, this is definitely the wedding invitation that is perfect for their needs. This is because the invitation features one half of the happy couple talking about the other. This invitation is then sent out to friends and family members, providing them with more insight into just why the other person is “the one”. 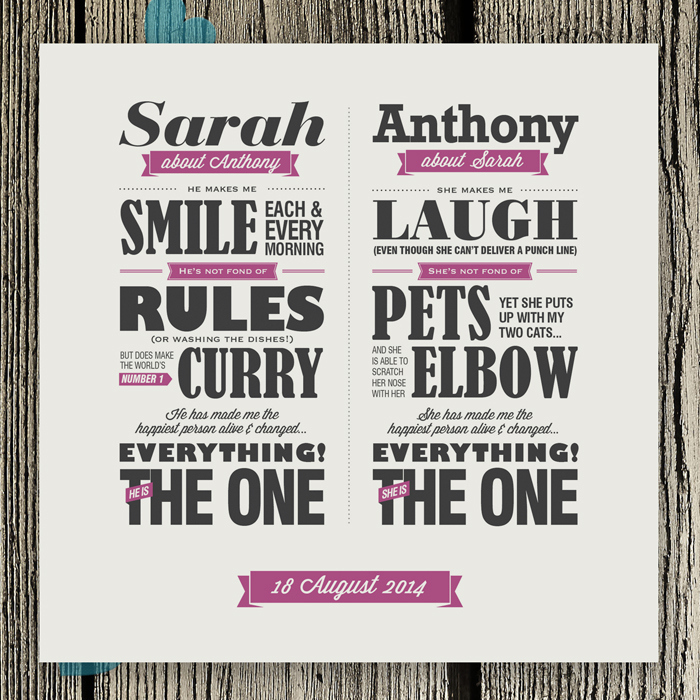 This is a fun wedding invitation that looks great, with a bold font and a stylish design. You can set the tone of the wording yourself so if you are looking to be romantic, playful or even daring, it is all down to you. There is also an opportunity to select other personalised stationery which means that all of your wedding administration can look as fresh and as funky as you want it to be. For a wedding invitation that provides insight to the happy couple and not just the facts of the happy day, The One wedding invitation is the one that is perfect for your needs.